After few weeks of launching 4G LTE in other states in Nigeria, Telecommunications service provider, Airtel NG, has entered a strategic partnership with Coverage Broadband (CB) a subsidiary of Phase3 Telecom, to launch 3flix mobile TV service. With this partnership, customers who subscribe to a special, bundle data plan on Airtel will now have unfettered access to 3flix live television channels. The service is an excellent family entertainer currently having 42 live TV channels covering all genres. In a statement, the company said, “The product boasts exciting content that is affordable and runs on ease-of-use features for subscribers to stream live TV on the go. 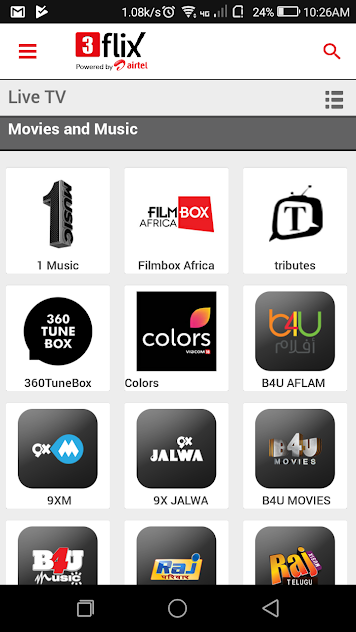 The 3flix TV app is designed for smartphones, and provides premium television content to subscribers across the country. I love this partnership. Nice one from airtel. I thought airtel is already in a partnership with iflix… Bro I wish you the best life has to offer as you celebrate Today. Another data consuming app legally brought to the subscribers. hope it doesn’t work with only Airtel network? This is a good strategic marketing from airtel. Thumbs up airtel. Happy birthday Remeo.